Then, for the next 2 years, we barely saw each other in highschool and honestly, probably never gave each other a second thought. Our junior year in highschool, we had a few classes together and sat next to each other in our English class. I would love to say it was “love at first sight”, but instead it was more like we both had the same odd sense of humor, didn’t care about “fitting in”, and just found each other to be a perfect fit. Russ & I got a job together at Clover Dept store and we worked in the snack bar together our senior year in high school. One of the security guards had a crazy crush on me that year and used to take pictures of me all the time with the security camera. We also used to go camping a lot with friends of ours in the summer and fall and it really was the best time! 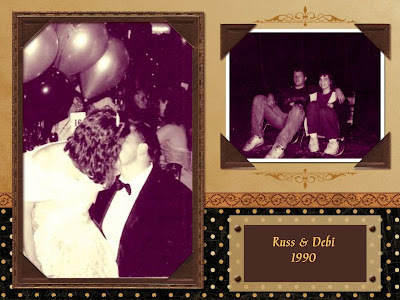 Ok, so we really were a very “kissy couple” waaaaay back then! By the time I turned 21, I had been home from college, was managing a pharmacy and had bought a home on my own in a small town. Russ had an apartment in the city, was working a security job and was waiting to start the police academy. I was ready to settle down and start a family and Russ wasn’t, so I told him I wanted to become a single foster parent and asked if he would be ok with my decision. He was. 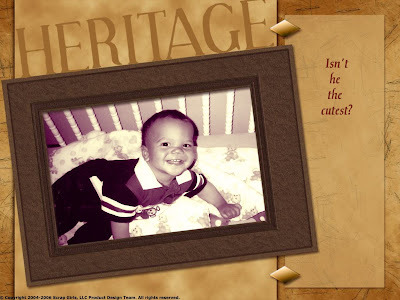 So, in June of 1994, I finished my classes and my first foster child was placed in my home- David. This was love at first sight! I knew from the second he arrived that I was never letting him go. He was the happiest little baby I had ever seen, with the most gorgeous big brown eyes. David immediately won me over and the first time he called Russ “dada”, that was it for him. 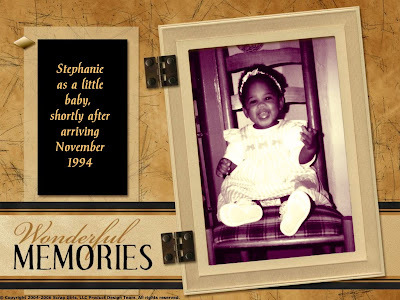 Stephanie arrived a few months after David. She was my first little girl and was just so beautiful and cuddly. 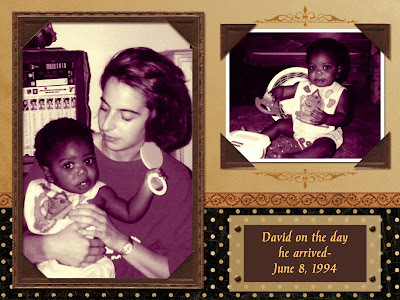 She and David were so cute together and always giving each other big hugs and kisses. Although David was almost a full year older, they were almost the same size, so I really got into dressing them alike and everyone thought they were twins (well, until they saw David’s mouth full of teeth & that Steph only had a few). I continued to work at the pharmacy and my parents watched David & Steph for me. Russ & I still spent plenty of time together, although what we called “dating” certainly changed as we could no longer go places without taking two little toddlers with us. This is when we realized that we had never been much for traditional “dates” and more preferred a cozy night at home. Russ finally got accepted into the police academy and I was sure that a proposal was in my future. 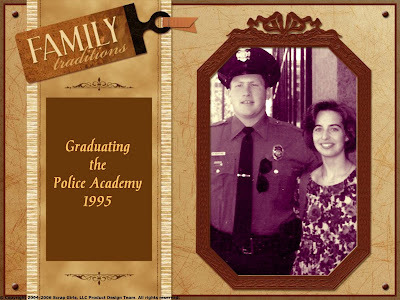 Russ graduated the academy and he didn’t propose. I was really upset with him and one night when we went out to dinner without the kids, I ripped into him about it. He yelled back at me,” You wanna get married??? Here’s your ring!” and he THREW.IT.AT.ME. That, folks, is how he proposed! He had planned on asking me that night, but I nagged and nagged until he couldn’t take it anymore and threw it at me. 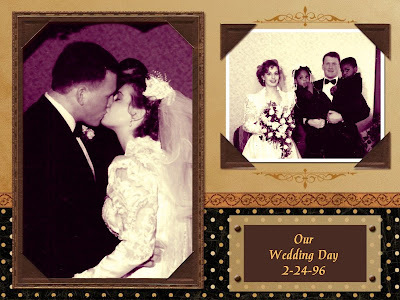 Shortly afterward, we began to plan the wedding, and ended up deciding to get married in a hall by a judge since Russ was Catholic & I was Lutheran. The judge who was going to marry us was the same judge who performed the adoptions of my younger siblings. So, it was going to be a special occassion after-all. I was disappointed to not get married in a church and honestly tried to convince Russ to elope, but we ended up agreeing finally on the plans. While the wedding plans were getting under way, I was called and asked if I could foster another child, Gabi. At this point, Russ & I had moved in together in my house and I was no longer working at the pharmacy, but instead working at a daycare that David & Stephanie were attending. David and she got along really well, but it was a different story for she & Stephanie. 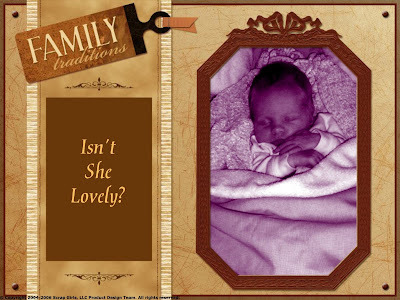 I guess they were too close in age and Steph had been the baby for almost a year, so Steph didn’t much appreciate having a new baby sister. It was rough at times, and other times they were all so cute to watch as they were all the same size and so close in age that the games & things they dreamed up were so funny & creative to watch. So, we decided that both of them would be in our wedding, since they were to be our children forever. David was to be the ring bearer and Stephanie was to be the flower girl (aka reluctant flower girl). 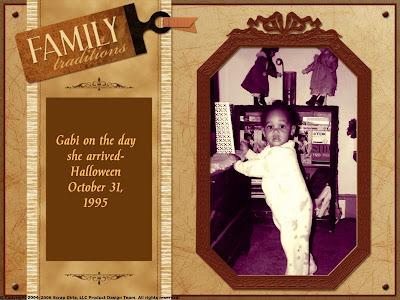 We had Gabi stay with a babysitter the day of the wedding and hired 2 women from the daycare to be aides to David & Stephanie the day of the wedding. Our wedding day turned out to be the only day in February that did not snow. Every day up until our date it stormed horribly and every day afterward as well, but our wedding day was beautiful & sunny. All of our friends and family came and celebrated with us, some traveling across the country to be with us, including my Maid of Honor, Angela. 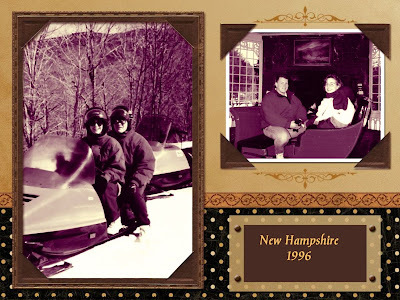 So, we left off at Russ and I driving for miles and miles to get to our honeymoon in New Hampshire at the Inn at Thorn Hill. We actually even drove through a blizzard on Mount Washington! My sister Missy, who was pregnant with my nephew Harry at the time, babysat the kids for us so that we could have a week away to ourselves. 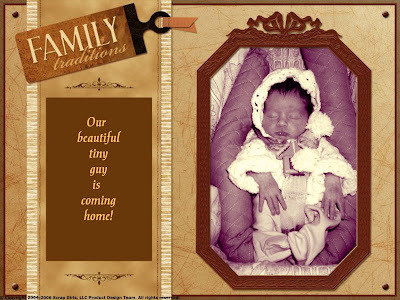 When we returned home, I wanted to start trying for a baby right away, but Russ wanted us to wait for a while. I have to admit I was really disappointed, but knew why he wanted to wait a little longer. 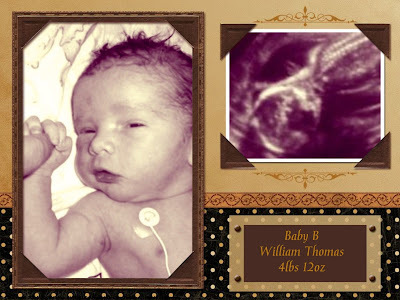 My pregnancy was fairly uneventful for the first 7 months and then, at 32 weeks, I went into labor. Russ raced home from work and drove us to the hospital, both of us freaking and thinking we were no where near prepared to bring a baby home. At the hospital I was put on a monitor and I was in full-blown labor! I was given a shot of Brethene and then placed on Magnesium, where I continued to contract and have horrible labor pains for nearly 15 hours before I was finally stopped. (ps This was supposed to be the day of my surprise shower… I surprised them!) I spent the next two days in the hospital in a Magnesium haze and then was released home on strict bedrest & Brethene for the next 6 weeks. On the exact day I was due, I went into labor! 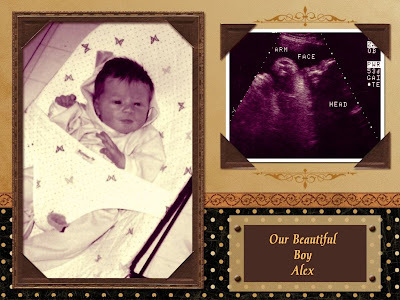 I gave birth to Alexander Joseph on April 23, 1997 after just 6 hours of labor. He was a healthy 8lbs 8oz. and he was gorgeous! 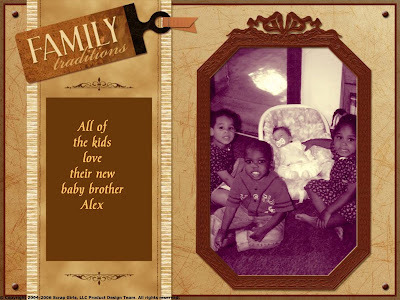 After giving birth to Alex, we took some time off from fostering for a few months and then when he was about 6 months old, we started taking in children again. I was no longer working, but had become a stay at home mom to three toddlers, a newborn, and whom ever was in need of a home. There were times that it was very hard and there were times where I loved every single second. Toddlers are the cutest people, in my opinion-So full of life and adventure! And, having three of them in the house at once, it was always an adventure! There were actually times where I had four toddlers and Alex, as we had a few different short term foster care placements through the year. The real challenge was getting them all out of the house to the playground. We had a HUGE wagon that sat 6 and boy, did that come in handy! 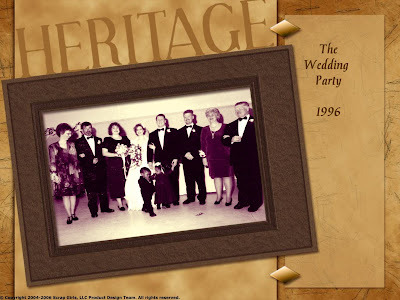 In June of 1998, we went away on a huge family vacation with all of my brothers, sisters, their families and my parents to a place in Maryland. It was one of the best vacations we have ever taken as we enjoyed a private beach for just us and basically had the place to ourselves. Turns out that we really did have a “good” time as although I was on birth control, I got pregnant with Henry. However, before realizing I was pregnant, we came home from vacation and I was asked to foster a little baby with medical problems. Russ and I said “yes” and Teddy was placed with us on July 1st. He was such an adorable baby, so chunky and round, and he looked like an Eskimo. So, my brother Jason affectionately began calling him “NaNook”. LOL ! It stuck and soon everyone was calling him that. 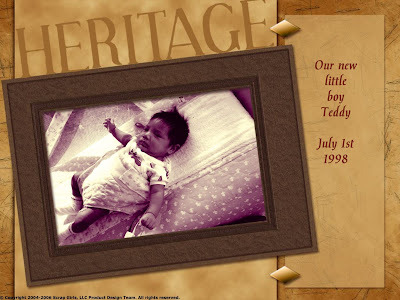 Poor Teddy was a really sick baby with terrible reflux and honestly NEVER slept, partly because of terrible pain and partly because the alarms from his apnea monitor constantly woke him up. He was moved to my mom’s house and I guess it was fate as just 3 days after he was moved, I went to my mom’s house, saw Teddy there and just knew we couldn’t let him go. We requested that he be placed back in our home and that is where he stayed. As “luck” would have it, when I was 22 weeks pregnant, I woke up to horrible contractions. I called to Russ and told him I was having pain and had him call my OB. We timed the contractions and sure enough, I was having preterm labor. The next few months proved to be a HUGE challenge and I never would’ve made it through without the help of my SIL, Wendy, who came to my house almost daily while Russ was working to help take care of all of the kids. 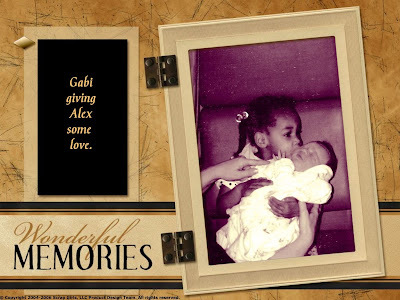 (remember, at the time I had David who was 6, Stephanie who was 5, Gabi who was 4, Alex who was almost 2, & Teddy who was almost 1) The days just blurred into each other and although it drug by, it also was so hectic that I barely remember anything. On March 25, 1999, I went into labor and was admitted to labor & delivery. My OB and I both thought I was 37 weeks pregnant, so she felt it was time to finally allow me to be “out of my misery”. I delivered Henry so quickly that I not only had no drugs, but my OB almost dropped him. 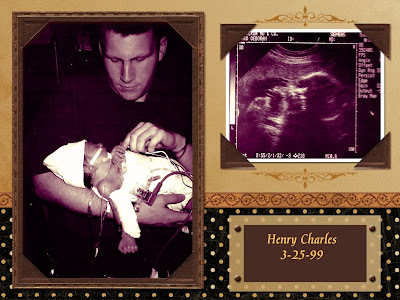 A big surprise to us- Henry was not a 37 weeker, but a 34 weeker! -Still covered in soft downy hair and so teeny tiny. He was 5lbs 8oz and was really struggling to breathe. 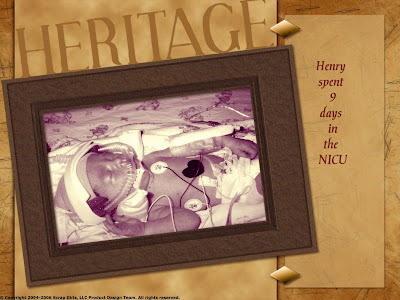 Unfortunately for us, the hospital where I delivered had no NICU, so Henry had to be transferred to Atlantic City and I was left behind. It was terribly depressing and hit me like a ton of bricks a few hours later when I woke up sobbing. The day after delivering I requested that I be released so that I could be with Henry and I spent the next nine days by his crib side in the NICU. There isn’t much that is harder than watching your baby suffer and know there is nothing you can do to stop it. On April 1st, we were called in the morning and told Henry was being released. Russ & I got a sitter, packed the bag with his beautiful sweater Russ’ mom made & his gorgeous preemie outfit my mom bought and we headed to the hospital so excited. When we arrived, we were told he wasn’t coming home afterall. Two days later, Henry did get to come home. It was Saturday, April 3rd, Easter Eve. It meant the world to us that all of our children would be home with us on the day of the resurrection. For the next few years, we were content just enjoying our home filled with little voices and concentrating on therapy for both Teddy & Henry, who had both been diagnosed with Cerebryl Palsy. We occassionally had some children placed in our home for short term foster care, but for the most part, we just had our 6 children and life was full and happy. In the fall of 2001, I had a miscarriage, and that got Russ and I, ok, mainly me, thinking about whether or not we wanted to have another child. It took me all of seconds to realize that I knew I wasn’t “done”. We decided to go off of birth control and leave things in God’s hands and continued to be foster parents, figuring that maybe God would decided to just place a child with us and we would know when we saw him or her. Without seeing him, we requested he be placed with us and fell in love. All of us! Keith was so darn charming that everyone who saw him, loved him. A few months after Keith was placed with us, we took a family vacation to Disney World and I had another miscarriage while walking around the park with our family. It was an absolutely horrible experience and will forever change my perception of “the greatest place on earth”. Not so much! 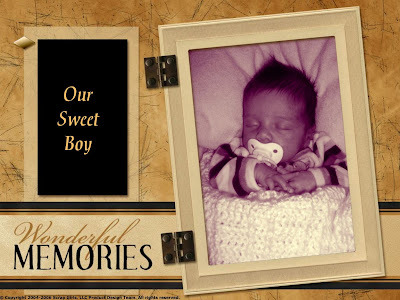 That miscarriage made me quickly realize that although we had a handsome little boy whom we loved & adored, that my biological clock was still ticking loudly and I knew I wasn’t done…. So, the story started HERE, and then continued HERE, and left off with me realizing that although Keith had been placed in our home and we had fallen in love with him, that I also was hearing the very loud tick of my biological clock. We held a huge celebration with family and friends and enjoyed the fact that a long hard fight to adopt them had come to an end. That year we also were blessed in having Keith’s biological mother decide that she wanted us to adopt him and she signed him over to us. This is not something that happens often in foster care and it honestly shocked us. 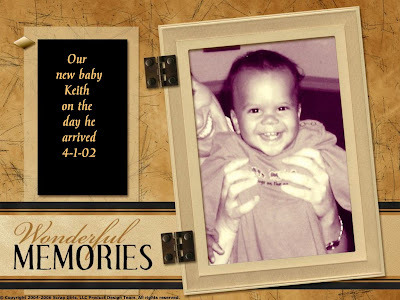 His mother was a very young girl who truly loved Keith and after meeting with Russ and I, decided that she wanted us to raise her son. We will forever feel blessed by that gift. As happy as we were that our family was becoming more permaneant, I still had an “itching” in the back of my head and an emptiness in the depths of my heart, as I knew God was not finished with us yet. We still took in a few foster children every once in a while, and even had a teenage girl and her 11 year old sister live with us for a few months. We expressed interest in allowing them to stay with us forever and unfortunately, it was at that time that NJ decided to change their fostering laws and not only turned us down for those sisters, but closed our home due to the number of children. 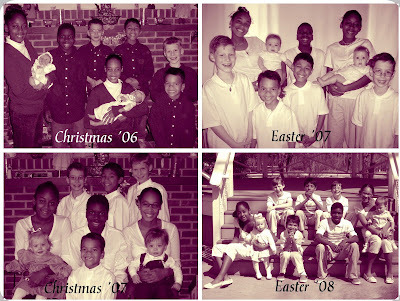 Through the next few years, the kids got older and became involved in church activities. I became the Sunday School Superintendent at our church and kept myself busy with the kids & church. It was a wonderful time as all of the kids really started to become truly interested in Christ and they really loved going to church and being very involved. We made wonderful friends and were very happy. But, always, I found myself preoccupied with the thoughts of a baby. Every single month I would pray I would be pregnant, and every.month.I.cried.FOR.YEARS. I prayed every month for God to either allow me to become pregnant or for God to help take away the desire that was consuming me. I prayed for strength and hope. yes, I did, but the desire was there all the same. I was sent for what I like to call a “tubal flushing” aka GUSHING. I was told I would have some slight spotting. HA! Or maybe I would almost bleed to death. It was THAT bad! On Friday I went into the office and was told by the doctors that I hadn’t ovulated yet and I cried all the way home, knowing I had and that they had missed it. I was a mess. Russ decided that we needed to get away since we were both so depressed about the whole situation. So, for the first time since we had gotten married, we went away without any kids! We went up to my parent’s vacation home in the mountains of Pennsylvania and celebrated our 10th wedding anniversary. The entire time we were there, I was throwing up. Every time I moved wrong, I felt sick. 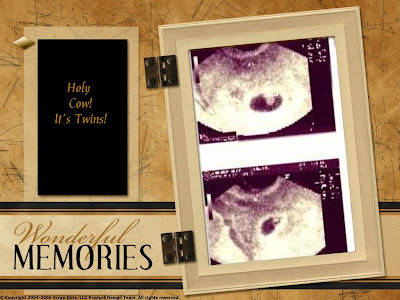 We decided that maybe, just maybe, I was pregnant and we bought a test. After 6 years of no successful pregnancies, I peed on a stick and it was positive RIGHT away. We laughed and cried and weren’t sure what we were seeing was real. When we got home, I called the doctors and told them and I had to go in for bloodwork. I then proceeded to freak out (in my head) and drove home from the office without my purse. Russ actually handled the news better than I did and accepted that it was twins far sooner than I did. The looks on their faces were so expectant and when we finally said, ” Mom is pregnant.” They all started to scream. Well, it was insane! LOL They were all jumping up and down, screaming with excitement, hugging each other. Both Stephanie & Alex were even crying. We then explained that they would all then need to really help out, that things weren’t going to be easy and they all made promises that they would all do what they could to make sure the babies were healthy. When I was just 14 weeks pregnant, I went shopping with Alex & Henry to a craft store and felt a sudden “pop” and then felt a gush. I thought my water had broken. I rushed from the store and drove home, shaking and crying. I was sure I had just lost both babies. I rushed in the door and went right to my bathroom and was shocked when I pulled my pants down to not see water, but BLOOD and lots and lots of it. I screamed for Russ and he rushed me to the ER as soon as we were able to get someone to the house to watch the kids. It took 8 hours for an ultra sound tech to arrive, but finally when she did, she was able to show me that both babies were still alive and well. I was sentenced to strict bedrest and told not to get up for anything but the bathroom and showers. It was stressful to say the least. My church stepped up and started cooking meals for our family almost every night. It was just so helpful. My pregnancy was plagued by every odd ailment known to man. I had my pubic bone split in half. I had constant contractions which led to Brethene, Magnesium, a few hospital stays & steroids. I had leaking fluid which was never explained- just told it wasn’t urine & wasn’t amnionic fluid…. what else is there??? I had Gall Bladder attacks and was eventually put on a fat free, taste free diet. YUM! I had reflux so bad I would be talking to someone and just throw up without knowing I was going to and ended up with insomnia that still visits me from time to time. By the time I hit 34w 5d, I had lost my mind! I had been on bedrest for longer than 6 months and I was finished! I stopped taking my Brethene and ran away from home. I refused to answer my cell phone and when I finally came home I told Russ I was done. That night was a Harvest Moon and I ordered Eggplant Parm– which is rumored to send women into labor. When we came home I was in terrible pain, partly because I had just eaten fatty food and my Gall bladder was going to explode & partly just because everything hurt by that point. The next morning I woke up to contractions and bleeding. Russ got me over to the hospital where we were greeted by my OB. She checked me and said that although the babies looked good and I hadn’t dilated any further, since she couldn’t explain the bleeding, she was going to deliver me. All of a sudden I changed my mind! Russ finally stopped me from my crying fit and told me it was happening and I just needed to get myself ready. Will was delivered second and he didn’t come easy. He was transverse and WAY up in my body. Russ likes to tell people that my OB had her arms all the way to her shoulders in my body to get him out. YUCK! He was so tiny and pink and also came out yelling. Both babies just did so well, I think we were all shocked. I had expected them to need to spend time in the NICU and when I was told they wouldn’t I was just amazed. 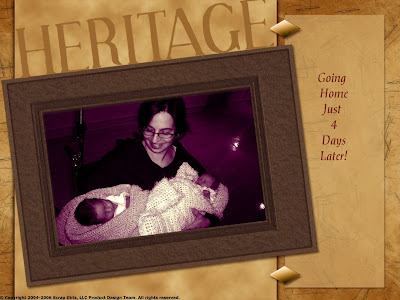 They came home from the hospital with me just four days after my c-section. 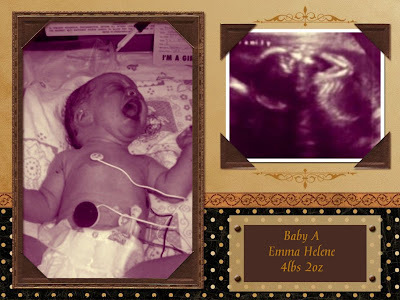 Emma had daddy wrapped around her little fingers from the second she made her way into this world. Will just stole everyone’s hearts with his quiet personality and then later, his absolutely infectious laugh. Once the babies arrived, I had fears of the kids being jealous of the time I would have to spend with the babies and had been warned by everyone that atleast one or two of them would surely act up. But, aside from Keith occassionally stealing their toys and the “usual” stuff, we haven’t had any issues. All of the older kids LOVE the babies. If anything, I find myself very often having to tell the kids to stop picking them up, stop getting in their faces, just let them play…etc. I know people often think I am crazy, especially because we had the babies. I get all sorts of questions asked, some rude, some nosey, but most often just curious. I try my best to be honest and tell them that sure we have our days when things are very rough, when I feel like I could tear out every last hair on my own head. But, those moments are outweighed by the days where I just look at my kids and realize how lucky I am to have been given the oppurtunity to just have them in my life. I have learned so much from them- how to be patient, how to accept things I can’t change, how to see the beauty in everything, but most importantly, how to love unconditionally. Happily ever after has taken on a whole new meaning. Infidelity has a way of changing that. The kids and I found out the exact same day when his mistress messaged me while our family was on vacation. She was angry because she was pregnant and Russ wasn’t returning her calls, so she threatened me. And that’s how I found out. After a night of little sleep and a lot of prayer, I decided I still loved my husband and if he loved me too that our marriage was worth saving. For four long, and fairly miserable years. Mostly because he made zero efforts to make it up to me, or the kids, and because he continued to cheat. Not only with his mistress, but with another woman as well. I discovered his continued infidelity on my son’s birthday in 2013. And kicked him out of my life. I packed his things up, contacted an attorney, and filed for divorce. The kids and I all attended counseling to deal with the feelings of abandonment and anger. Three years later, I have graduated from college at the top of my class. I passed my certification and am officially a Medical Assistant. I externed at a cancer clinic and loved working in that atmosphere, which in turn made it easier for me to accept and understand my own breast cancer diagnosis on September 21, 2016. I am in love with a great man, Hugh, who is nothing at all like my ex husband. Hugh has definitely made me realize what it means to be in a relationship with someone who puts another person (and their children) first. He is not only great to me, but he loves my children. We’ve been together for over a year and he is making it a lot easier for me to fight my cancer battle because I know I have a forever future with this loving man. They do miss their dad but his choices are his alone and the kids are coming to terms with accepting where they fall in his life. The kids are making great choices with their lives, especially as they come into adulthood and definitely seem to be learning from the mistakes and good choices of their parents. They make me proud every day. Debi, This was long, and I just had to read it all the way to the end. I hope I meet you sometime at one of the PSMM workshops! What a story! You could write a book or 2. Thank you Barb for taking the time to read our story. Just read your story, very interesting, thanks for sharing. wow! I got teary eyed reading your story. Thanks a lot for sharing…you guys are amazing parents….you have beautiful children…I salute you! What a story. You guys are a special family for sure. Thanks for sharing your story. Read it from beginning to end! You guys are truly angels of God! The kids look happy! You have inspired me! I am so happy to have discovered your blog today. Thank you. Very nice to meet you as well. Thank you for taking the time to read our story. It always means a lot to me when someone takes the time. Wow! I need to show my husband this! I've been thinking a lot about fostering and/or adopting a baby, but my husband keeps ducking out of the conversation. I can't blame him, our finances are stretched to the limit and boy our kids are quite the handful but… I really want to. I also really identified with the difficult pregnancies. Both my pregnancies were horrible and the second one was worse than the first, I ended in the hospital and on bed rest too. I just discovered your blog today and I am so happy that I did! It has been extremely comforting reading about how you've handled your husband's infidelity; knowing that even though it's an insane amount of hard work, it's still possible. And reading about all of your kids was so touching! Your children are beautiful. You are blessed to have them, and they're blessed to have you. Debi, I just read this!! WOW!!! What an amazing, loving story. Your family and the story how everyone came to you is wonderful. Thank you for sharing, I had alway seen 9kids on PSMM and wondered how. They are all so gorgeous and I love how happy they all are in the pictures. Stephanie and Gabi look like they love being big sisters holding the twins in all the family shots! I was just completely consumed by your amazing story, and feel like I "know" you all now. You have one of THE most beautiful families I have ever seen. So glad I found this blog… although I may be up reading it like a novel till the wee hours! HA! & thank you for the lovely compliment. I read this a long time ago and visit you blog back and forth. I just now feel compelled to tell you that you are a remarkable young woman! I admire your tenacity and bravery. Even on your bad days you still radiate love for your family. A kindred spirit in England. Thank you so much Lynette. 18 and going on ?